In 1911 the Titanic was launched from the Harland and Wolff shipyard. Such was the industrial prowess of Belfast that the Titanic was then (though, of course, only briefly) the largest ship in the world. The wealth of Belfast was driven by the shipyards, the men who owned them and worked in them. 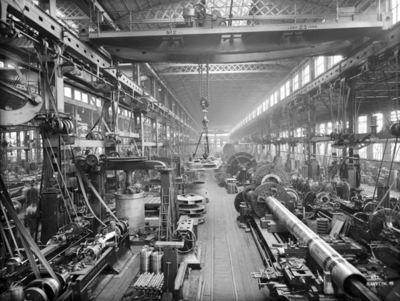 This was a world of engineers and boiler-makers and other skilled tradesmen. Besides the shipyards, the linen mills of the city were also thriving. 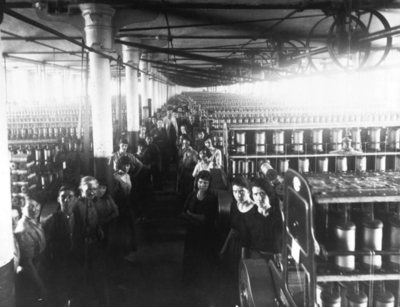 With thousands of women employed all across the city , Belfast was the largest linen producing centre in the world. 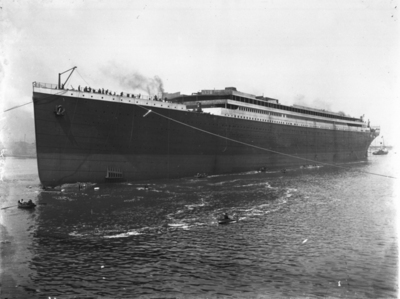 © Ulster Museum 2008 H10-46-135: The launch of RMS Titanic, 13 May 1911, at H & W yard at Queen’s Island. Around these industries, a whole range of other industries also flourished. There were engineering works and car-makers and tobacco factories and ginger ale manufacturers. The commercial aspect of the city was confirmed by the range of businesses and shops which flourished. There were bakeries, co-operatives, A. C. Williamson’s shop at the corner of York Street and Bentinck Street, spirit groceries such as Stafford Clairs on the Ormeau Road. Lilliput Laundry and Dyeworks on Cosgrove Street did not merely clean and dye clothes, it also remodelled hats and repaired shoes and boots. Gribbon Bros. made handkerchiefs on Adelaide Street. 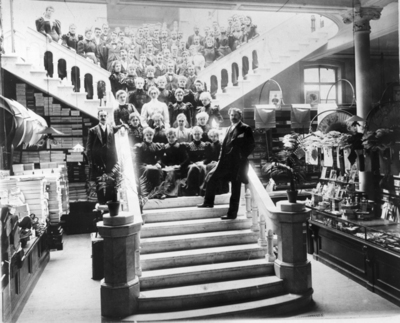 © Ulster Museum 2008 Y33316: The staff of Anderson and McAuley’s department store, one of Belfast’s most illustrious shopping venues, n.d. The prosperity of Belfast was not equally distributed amongst its citizens. There was a vast difference in the lives of those who lived in the luxurious homes of the Malone Road and the Antrim Road, and the lives of those who lived in poor working-class areas. The elite suburban world of Belfast was populated by the men who owned the most successful companies in Belfast. They gathered to meet in the Ulster Club on Castle Place, and kept servants, gardeners and chauffeurs to run their houses. This was a tight, closeted community, most of whom had made their money through the prosperity of the second half of the nineteenth century. The better suburbs were home to more middle-class families. They congregated in places such as University Square. This professional class of engineers, barristers, solicitors, accountants, doctors, managers and civil servants filled the city’s rugby and cricket clubs, and sent their children to fee-paying schools. They did not hold the spectacular wealth of the men who owned the industry, but could be considered well-off, particularly in the context of the poverty beneath them. A further level below were the skilled tradesmen, many of whom worked in the shipbuilding industry or in building the housing estates that developed decade after decade around the city. They were manual labourers but their trades set them apart from the vast body of unskilled labourers who filled the city. They worked long hours, but earned an income which was respectable enough to confer a decent measure of comfort and security. Mostly, their wives did not work and their children attended national schools . The life of unskilled labourers and was altogether more precarious A Royal Commission of 1908 laid bare the poor quality of life for the poor of Belfast. Much of the housing in the city was built to reasonable standards, but slum conditions such as those around Abbey Street endured. The slums were not as extensive as Dublin, but thousands of families lived in cramped, unsanitary dwellings, away from the prosperous streets and squares. Throughout the nineteenth century, generations of people had left the agricultural lands of Ulster and beyond, and had come to Belfast in such of industrial work. This was the type of insecurity which was so typical of unskilled working class life across the United Kingdom of Great Britain and Ireland. It was usually subsistence, and families often relied upon the ability of wives and children to earn money. Most people earned enough to keep themselves in lodging, but destitution was also a constant presence in the city. 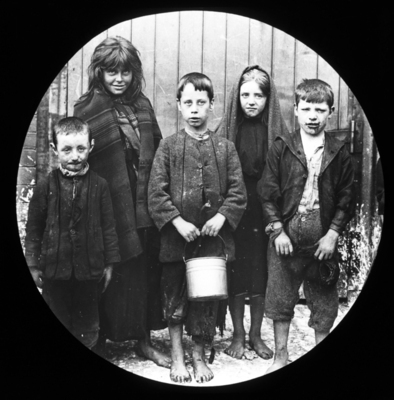 © Ulster Museum 2008 Y8596: Child poverty in Belfast, early 1900s. There was a tradition of humanitarianism and philanthropy in the city, but there was also the sense that political divides and the primacy of commerce in the city limited the provision of adequate welfare support for those in need. There was municipal help, including a corporation hostel for homeless men called Carrick House, but there was also periodic comment from councillors which demonstrated a lack of sympathy for those who were struggling. City councillors were recorded as remarking that misery and starvation were ‘the fault of the parties themselves’. 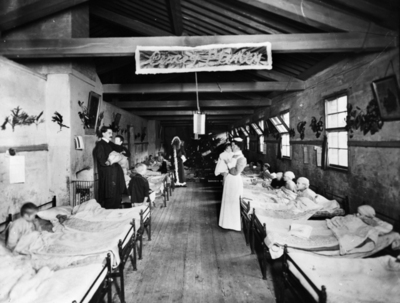 Health of workers was undoubtedly impaired by the hot and humid conditions in spinning rooms. The position of women in the city was not helped by the appalling pay they received and unprotected working conditions which saw them often paid short-time wages. There was a significant level of prostitution, with the brothels in the city enjoying substantial custom, not least from those who worked in the docks and warehouse, and those who were stationed in barracks. Inner-city areas frequented by prostitutes were targeted by vigilance committees – a move which had the unintended effect of driving the trade out into the suburbs. Children, too, often earned their keep. Begging on the streets was a regular feature. There were also boys and girls selling newspapers or flowers, running messages, hawking sticks and much else. 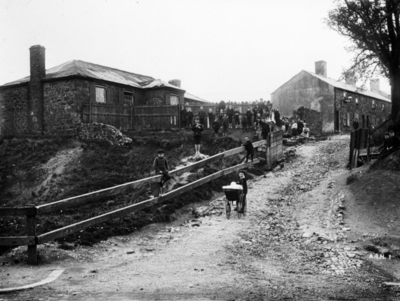 There were also more than 2,000 children between the ages of 10 and 14 who alternated their days between the schoolroom and the linen mills, earning a few extra shillings to help sustain their families. On York road, for example, the national school stood right beside a spinning mill. Indeed, during the early years of the twentieth century, school was far from being a certainty for every Belfast child. In 1914, for example, 15,000 children in Belfast were without a school place and for thousands more non-attendance was a regular occurrence. Only one child in sixty passed from national to secondary school. With few scholarships on offer, secondary school was the preserve of those who could afford it. Overall, educational facilities in Belfast were simply unable to keep pace with the rate of growth in the city in the second half of the nineteenth century . Keeping a family going in such circumstances was no simple task. Food was bought from hawkers carts which passed through the streets in the evening, selling cockles and mussels, or cheap imported meat. It says something for the subsistence level of existence for many in Belfast that there were more than 100 pawnbrokers in the city in 1911. Moneylenders also operated, charging 15 per cent interest. If everything else failed the Belfast Union Workhouse was the place of last resort. 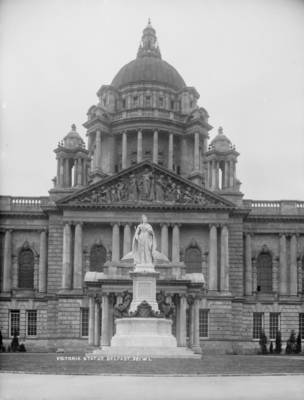 Belfast had the lowest pauper rate in the United Kingdom, not least due to the minimalist approach taken by the municipal authorities towards providing relief . © Ulster Museum 2008 Y8535: Christmas Day in the children’s ward of Belfast Workhouse, ca. 1906. Note the gloomy Santa Claus. A range of activists and trade unionists sought to improve life in the city. The Irish Women’s Suffrage Society met weekly, organised open-air meetings and paraded the city streets. Trade unionists worked extensively to organise the workforce in an attempt to improve conditions. Jim Larkin came from Liverpool to Belfast as a National Union of Dock Labourers organiser. There were periodic strikes, including a major one at the docks in 1907 and some improvements were made in the lives of workers, but poverty remained the watchword for many in the city.